Like butternut squash, Hubbard squash and pumpkin, acorn squash is a type of winter squash. These vegetables are harvested in the fall and can be stored for up to six months without losing a significant amount of nutrients. The green speckled skin of an acorn squash is thick and inedible, but the orange-yellow flesh inside is prized for its combination of sweet and peppery flavors. Acorn squash come in different sizes, so their nutritional value and serving size is typically measured in relation to 1 cup of cubed, cooked squash. This single serving provides about 115 calories, 2 grams of protein, 30 grams of carbohydrate and 9 grams of fiber, or 36 percent of the recommended daily value. Acorn squash has no fat and no cholesterol. With just 8 milligrams of sodium per serving, it's also virtually sodium-free. A 1-cup serving of acorn squash delivers 37 percent and 18 percent of the recommended daily values for vitamins C and A, respectively, and 23 percent and 20 percent of the recommended daily values for thiamin and vitamin B-6, respectively. Acorn squash contains a wide variety of minerals, as well. A 1-cup serving supplies more than 20 percent each of the daily values for magnesium, potassium and manganese, and just over 10 percent of the daily value for iron. Acorn squash also contains trace amounts of niacin, calcium, zinc, phosphorus, copper, selenium and folate. Acorn squash, like other winter squash varieties, is high in phytochemicals. These compounds demonstrate antioxidant activity and are essential for proper physiological functioning. 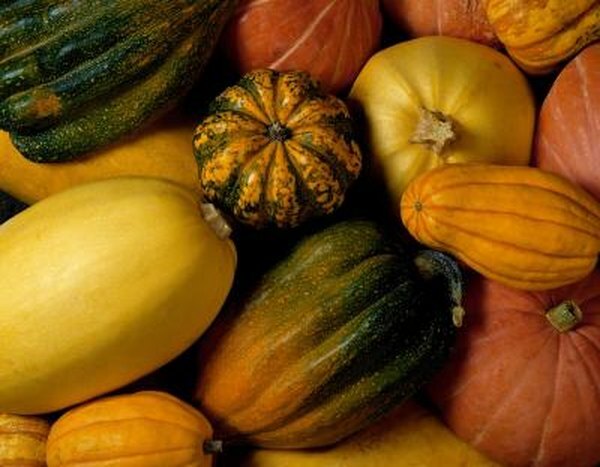 One powerful compound in winter squash is beta-cryptoxanthin, a pigment that exerts a protective effect on lung cells. Other phytochemicals in acorn squash include beta-carotene, lycopene and lutein. The combination of nutrients and phytochemicals in acorn squash may be partially responsible for this vegetable's protective health effects. Acorn squash may help protect against diabetes, osteoarthritis, certain types of cancer, rheumatoid arthritis and asthma. The folate in acorn squash can help prevent birth defects. Acorn squash has a glycemic load of 8, which means that a single serving does not raise blood sugar levels significantly. Foods with glycemic load scores lower than 10 are considered appropriate for a diabetic diet or a low-glycemic diet for individuals trying to lose weight. The starchy vegetable's relatively low glycemic load is largely a result of its high fiber content.